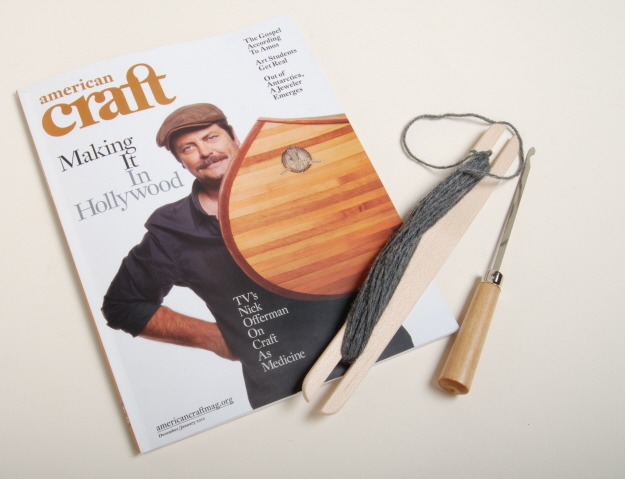 Much in the current issue (December/January 2012) of American Craft resonated with me. I want to share some of these things with you and to also encourage you to pick up a copy at your local newsstand. In her editorial, Monica Moses talks about Parks and Recreations’ Nick Offerman’s need for woodworking as a way to find solace in every day living. There’s more to ponder in her article, which is a lead in to several features about craft and education in the magazine that caused me to think: Just what do I want my role to be as a handweaver, as a craftswoman, to ensure that not only the future of the craft continues, but that craft lives to nurture, challenge, and sustain future generations of creative and thinking individuals?